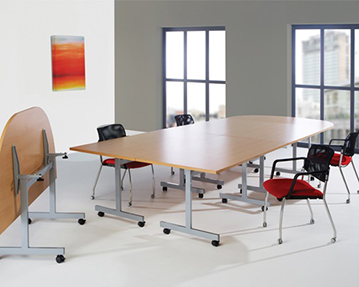 string(23) "Flip Top Folding Tables"
If you’re looking for practical, space-saving furniture for your workplace, our fliptop tables could be the perfect solution. 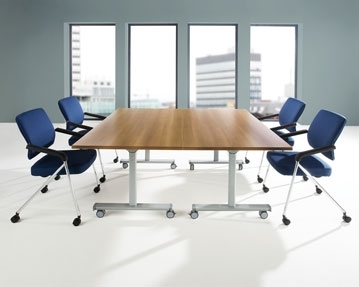 Suitable for meeting spaces and boardrooms, these multi-purpose folding tables can be quickly and easily arranged in a variety of configurations, making them an ideal choice for offices that require additional space from time to time. 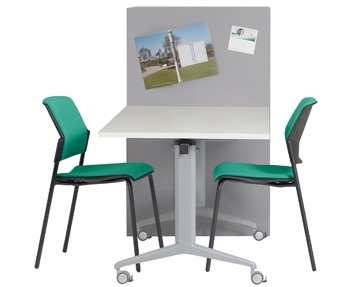 The tabletops fold down and nest together for compact storage, allowing you to adapt your office to fit your needs. Mounted on wheels, they can easily be moved around to suit your changing requirements and they feature lockable castors for added stability. 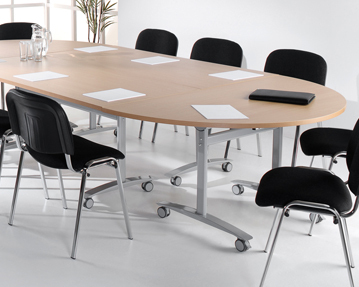 Many of our fliptop meeting tables include a range of handy features, such as wipe-clean surfaces, protective edge binding, smooth-glide castors and easy locking hand wheel adjustments. They also come in a range of dimensions and shapes, including rectangular, semi-circular and trapezoidal designs. In addition, you can take your pick from an array of contemporary wooden surfaces. Featuring robust metal frames and durable worktops, these tables are manufactured using the highest quality materials to ensure they stand the test of time. To find out more about our innovative fliptop meeting tables, take a look around our site or contact our team of furniture experts today.